Before you can create the shader, you must create an object to test the shader out on so that you will feel comfortable with your results. I have chosen to do the traditional cardboard box for this. 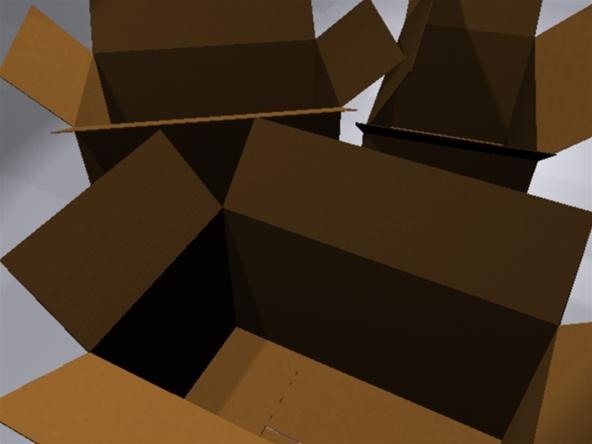 Now select the regions/faces/objects that would be intended with the nature of cardboard and add a new Lambert Material to them. Click the black & white checkered button to the right of the color attribute and select fractal. Customize the fractal's attributes and color values as desired. This may take some time to get it just right: took me about 20-30min my first time. Again, Click the black & white checkered button to the left of the Bump Mapping attribute and select grid. Set the U Width attribute to the grid to '0', the V Width to '.5', and the Contrast to .69 or .7. For the Line and Filler Colors, set them slightly apart. (If you don't wan't to mess with the bump map attributes, then I recommend the colors to be around mid way). To make this map look more realistic and nice we need to smooth the grid: to do this, go under Effects for the grid and set the Filter Offset to about '.3'. Quickly create a scene and render with mental ray to see how you did!